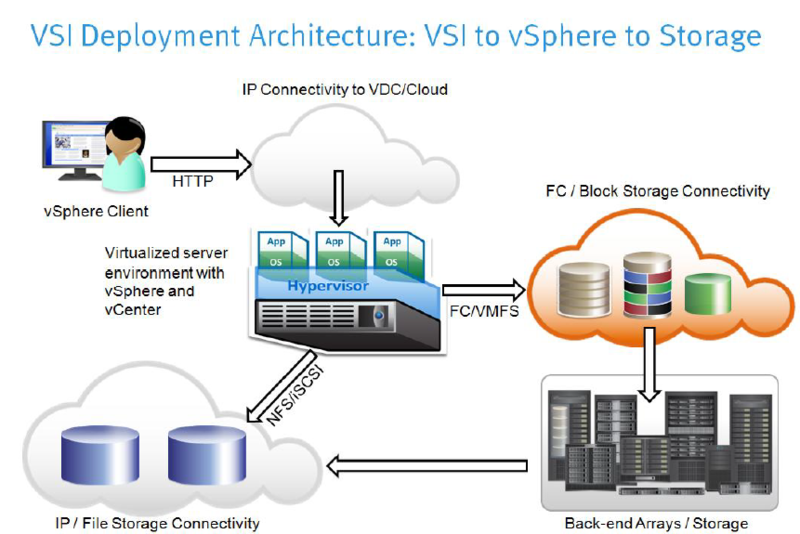 Shown is a typical deployment of VSI with VMware vSphere. The vSphere client connects to the vCenter server via IP and subsequently connects to the elements in the environment in a variety of different ways- either FC, or IP. 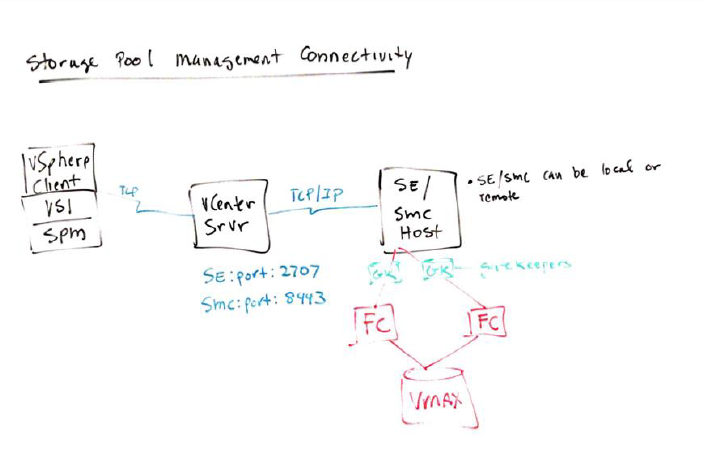 In environments where Storage Pool Management is going to be used, the vSphere client connecting to the vCenter server, will need to configure and communicate with a server which has SMC installed. 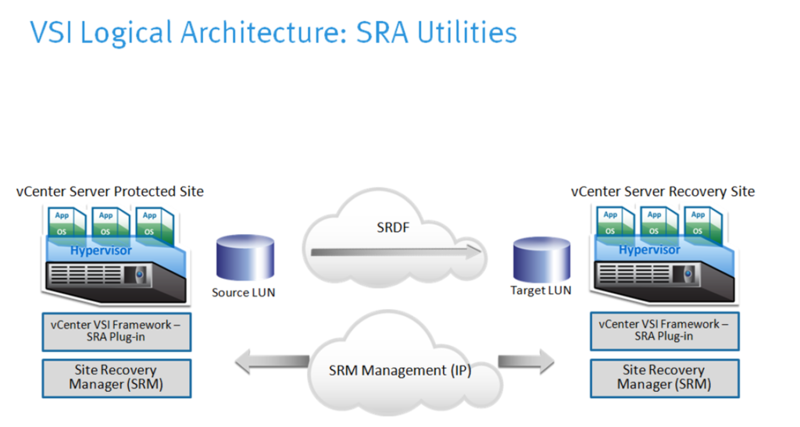 In environments with VSI SRA, the SRA Utilities should be installed on the vCenter server. VSI is a framework which comes with all/any of the plug-ins and then subsequently plug-ins install into the framework and become ‘features’ of VSI. Client installation requirement: VMware vSphere client version 4.0 update 1 or later must be installed. VSI will not install if the VMware vSphere client is not already installed. Storage Pool Management, requires Symmetrix Management Console, and port 8443 (configurable). Additionally requires setup of storage pools on the array and SPM connectivity (account on SMC). The SMC host is typically a separate host in the environment. 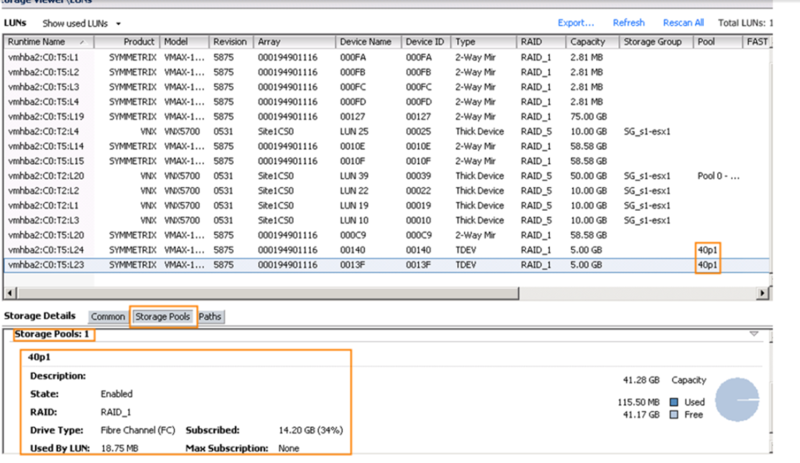 Storage Pool Management has similar connection requirements to VSI Storage Viewer but also requires IP connectivity to a SMC server which in turn is connected FC to the arrays requiring to be managed. Storage Pool Management (SPM) is a plug-in of the VSI framework, which is installed in the vSphere client. We’ll discuss and explore SPM in our demos in this training. Shown in the diagram, we have a logical flow of how connectivity is constructed within the environment: vSphere to SPM to vCenter to SMC/Solutions Enabler to the LUNs within the array. To the left and below that is a logical diagram of what a potential VSI to vCenter with SPM environment may actually look like. •ESX/ESXi 4.0 update 1 or later Shown in this diagram, the vSphere client has SPM installed which is then connecting over IP to the vCenter server. Storage Pool configuration and management is performed via the SMC host which has direct management capabilities on the array. The SMC host must have storage pool management feature components enabled and you must create a virtualization domain on the server for the array. From there you expose ‘pools’ to your virtual data centers and have Storage Pool Management allocate and provision storage as needed within the environment. VSI Storage Pool Management, is a complex topic. SPM allows the VSI administrator to allocate and assign storage in the VM environment dynamically. They can create datastores, remove datastores, expand or shrink datastores, create virtual LUNs, RDMs, assign storage pool capacities to hosts, etc. Storage pool functionality is predicated upon there being a virtualization domain on the SMC server which manages the arrays to be provisioned. Once a virtualization domain with a storage pool has been created and provisioned to the VDC or virtualization host, the virtualization administrator can then use VSI/SPM to provision storage as required. We’ll investigate this functionality of VSI in our recorded demo. Shown here is Storage Viewer’s perspective into the storage pools of the environment. 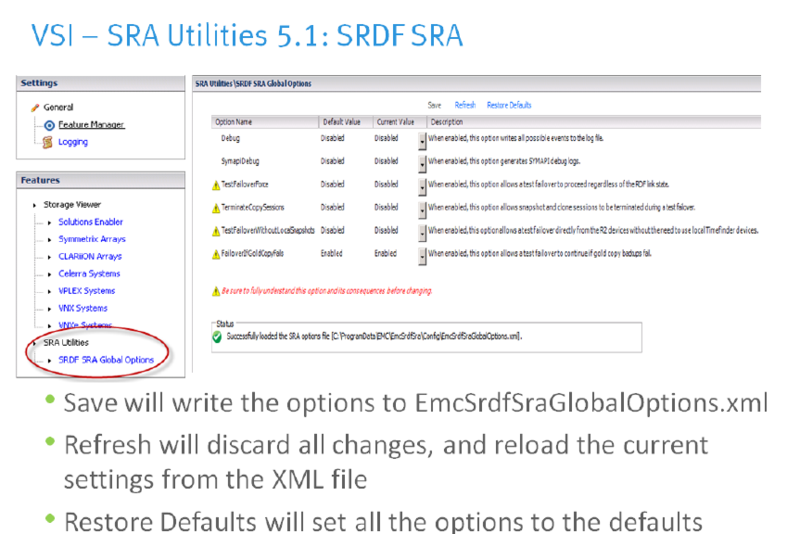 SRA Utilities is shown and launches from the Home screen in VSI, under feature manager, SRA utilities. Shown here are the SRDF SRA global options. This demo will show SRA Utility discovery, group configuration, showing gold copies, recovery devices, etc.